Thanks to its distinctive white colour, the beluga whale is also known as the white whale. Smaller than most whales, the male beluga is usually about 4 to 5 metres long, and the female about 2 to 3 metres long. It’s not only their colour and size that make them different from most other whales, but also their large, protruding foreheads, and their ability to move their necks far more freely than most whales can. This is due to the beluga having 7 vertebrae in its neck that are not fused, which allows it to turn its head easily in all directions (something that those down at Bakersfield CA Towing Services may find interesting). 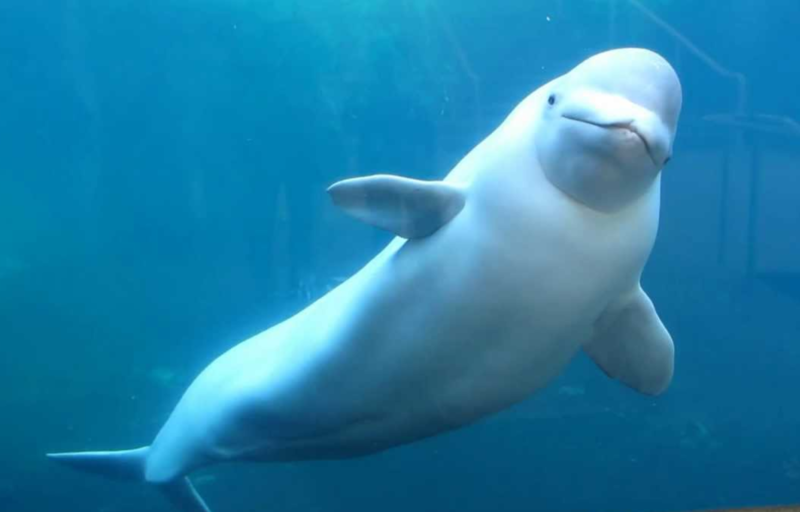 The beluga whale is one of only two creatures belonging to the Monodontidae family, the other being the equally-unique narwhal (the whale that I, probably along with many, think of as the unicorn of the sea). Like the narwhal, the beluga has no dorsal fin, which allows it to swim easily under the ice beneath which it lives. Belugas mostly inhabit the Arctic Ocean, and can be found in the seas surrounding North America, Greenland, and Russia. In the winter, most of them can be found spending their time congregated around the Arctic ice cap. The diet of the beluga whale consists largely of snails, squid, octopus, shrimp, certain types of fish, and other such delicious things they find in their frigid Arctic waters. They locate their food using a series of clicks, chirps, and whistles. Belugas have no vocal chords (which is a trait it shares with other toothed whales), and the sounds are very likely produced by the movement of air near the blowhole, specifically between the two nasal sacks. Its tell-tale high-pitched twitter has earned it the nickname of sea canary. Belugas do much of their hunting in groups, being sociable animals. They travel in pods that include on average about 10 whales, but can contain anywhere from 2 to 25. Each pod is likely to include both male and female belugas, and will be led by a dominant male. These pods are mutable, and often belugas will travel from pod to pod, not feeling any particular attachment to one or another. They are also very curious, playful creatures, known to swim alongside boats, to chase and play with each other, and to amuse themselves with objects they find in the water, both in nature and in captivity. Belugas mate in the spring, and a female beluga will give birth every 2 to 3 years. When they do give birth, the females will travel to shallow waters, where the water is warmer. The calves are not born white, but rather they are dark grey, and will become lighter as they mature. 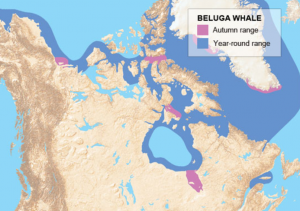 Thanks to commercial hunting in the 19th and into the 20th centuries, as well as threats from predators and disease, belugas have been placed on the Red List as a “near threatened” species by the IUCN, and two of the seven beluga populations that live in Canada are listed as endangered.